Employees whose managers are open and approachable are more engaged. And those who can talk to their manager about non-work things are even more engaged. People who find you approachable will share information and ask for your advice. Successful senior leadership is about being able to include people who can openly give you the information you need. The best managers make a concentrated effort to get to know their employees and help them feel comfortable talking about any subject, whether it is work related or not. A productive workplace is one in which people feel safe (Psychological Safety) — safe enough to experiment, to challenge, to share information and to support one another. In this type of workplace, team members are prepared to give the manager and their organization the benefit of the doubt. But none of this can happen if employees do not feel cared about. When you get ideas and suggestions from colleagues or your team, appreciate them. If you are lost in your phone/computer or always have headphones on people will not find you approachable. Do random people come to talk to you? How do you make your time available? How rushed are your in one on one meetings? Do you pass credit for ideas given to you? How much do you know about your people? How do you encourage your leaders to ask you questions? Are you approachable to all people, regardless of their race, gender or level in the organization? How good are your inter departmental connections, how good is your non work network? 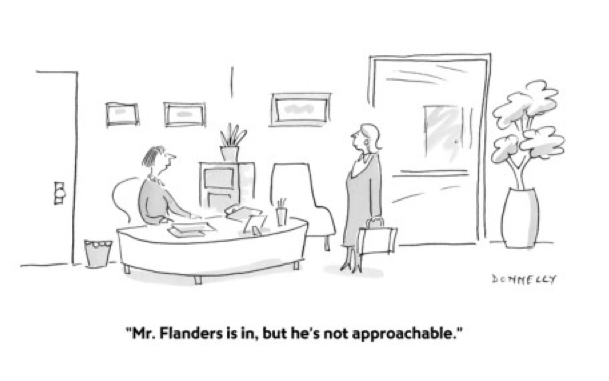 Blog -> How Approachable Are You?